You shouldn't have touched anything from that basement. A bloodshot title card and the hammering notes of a dread chorale close out a weekend getaway quite literally from Hell. Before the audience is allowed to escape this cabin in the woods though, Aparato’s gruesome title sequence for Evil Dead – an “homage to gore,” as Director Fede Alvarez calls it – forces them to relive every murderous detail of the proceedings in a ghastly instant replay of sorts. Globules of blood hover in the murk, like the embers of a dying fire; a rivulet of red slinks down a decaying staircase, dripping into a waiting pool of carnage. Soon, the vital fluid begins splattering the walls and floors, the ferocity of Roque Baños’ score increasing to match the foul play. Limbs are hacked, nails pierce muscle and splinter wood, and a smoking chainsaw chews through flesh and bone in an ever more violent summary of Deadite deaths and self-inflicted savagery. Demonic scripture flashes, blood rains, and the screen is consumed by flame. A discussion with Aparato Creative Director ALEJANDRO DAMIANI and Director FEDE ALVAREZ. Give us a little background on Aparato. AD: Aparato was founded in 2008 by Fede Alvarez, Guillermo Carbonell, and Pedro Lafferanderie, and quickly became one of the leading VFX Houses in Uruguay and the region. I've been in charge of the creative direction since 2010 when I was invited to join the company. AD: Fede needed a strong and memorable ending to his film, and thought Aparato would be the perfect place to create something epic − on a budget. AD: We have a long relationship with Fede, and thought this was a perfect opportunity to work together again. From the get-go, Fede and Sam Raimi gave us complete creative control and gave us the chance to do whatever we wanted to. 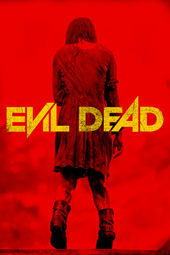 AD: The original concept was really simple, to pay tribute to the gory aspects of the Evil Dead films. We knew it should be simple and overwhelming, and we were sure it had to be very analog as opposed to digital. 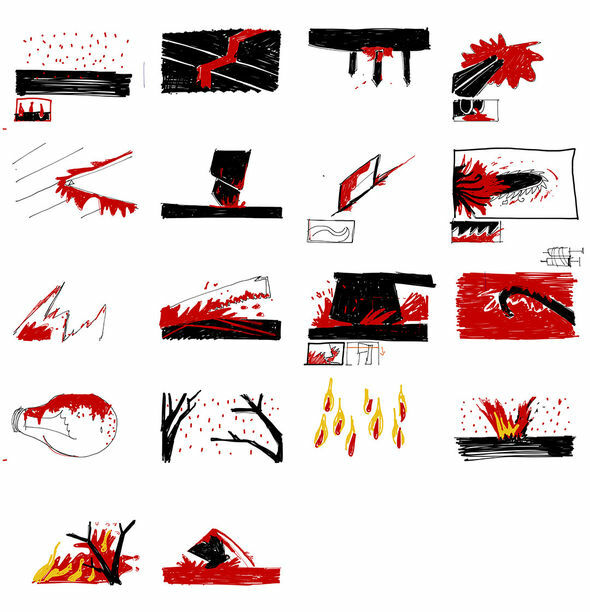 After thinking about many approaches with my creative partners, Javi (Javier Cruzado) and Chico (Chico Jofilsan), we chose a really simple idea of background and figure, where the blood would be the graphic element that discovers the shapes and forms. We wanted something raw, simple, and obviously, as gory as possible. FA: It mostly came from Alejandro. He created the whole thing. When we first talked about it we wanted to do something that felt classic and modern at the same time, so we didn’t want to use anything too fancy like CGI or animation. We wanted to use classic techniques. Alejandro wanted to do an homage to the gore fest that the movie is and gore in general, so that’s why we had all the splattering blood mixed with the concepts from the film. We looked at it as little pictures of things you might have missed while watching the movie. Most of the big moments in the sequence are extracted from scenes in the film. So the concept was a little window into things that happened during the movie. What kind of research did you do in preparation for the sequence? AD: Around 20 people were involved in the shoot and the post-production work. How much of the sequence was filmed as practical effects vs. digital effects? AD: Most of the sequence is practical. We had two reasons to do it this way. First, we wanted the tone to be appropriate for the film, so big digital VFX didn’t have a place. Second, with the short amount of time we had to go from concept to final delivery (about two weeks), the more we could generate practically, the better. We actually thought of shooting the title cards practically, but this was really risky because you have very small margin for corrections. Finally, we opted for non-intrusive graphics to keep that practical feeling alive. What was the live action effects shoot like? AD: It was a very long shooting day at the studio. It was fun and gross at the same time. We knew exactly what we needed, and we did exactly that, no more and no less. We used a Phantom camera. Tell us about the music - Did you plan the sequence with that music in mind? AD: Yes, it has a really interesting beat that helped us in thinking about the titles. The music was composed by Roque Baños, who I had the pleasure to meet at the Evil Dead screening at SXSW. AD: At Aparato we're always busy! We are now working on the VFX and main titles for a Lionsgate Film called Aztec Warrior. Also working a lot for China, Mexico, and Colombia. Producing two 3D character animation short film commercials, and developing a feature film. Fortunately, the constant growth gives us the chance to choose and work on the projects we are really passionate about.